We spent a year and change looking with John Ince with Nest Realty all over Albemarle County and the surrounding area. Some places were great houses on so-so land, some were so-so houses on amazing land, and many were simply either too far from Charlottesville or didn't have the internet access we require to both work from home. We've been very lucky and blessed to find this almost-fifteen-acre property just north of Charlottesville in an area called Stony Point. It's about 10 minutes North of Charlottesville and about halfway between C-ville and Barboursville. We're still unpacking and settling in but we wanted to show you all around (virtually, that is). The house is a 1-½ story house built in the 1950s and it was rennovated about 2 years ago (before the previous owner purchased it). They changed the siding to board and batten, which looks much better than the original vinyl faux horizontal board. It has two bedrooms upstairs—one for Quincy and the other as a guest room/Whitney's office. Our master suite is downstairs and there's a nice living area as well with an awesome old Vermont Castings wood stove. There is an old garage with a dirt floor that serves as firewood storage and toolshed and also a brand new 1-stall barn with tack room that we'll be converting into my office. The barn and paddocks were built by the previous owner and surround the house in a U shape. They connect to the barn and contain a new run-in shed as well as automatic watering units for livestock. They can be joined together at the top of the alley leading down to the one-acre pond if so desired. The backyard (between the paddocks and the house) is nice and shaded and we have been enjoying the view from the porch (from which we can see the Southwest Mountains to the South) and West. If you look closely on the right side of that image, you can see the outdoor shower. It's pretty awesome and will help cut down on the dirt inside during the "a farm is a large sandbox for adults" projects. There are two other fields on the outsides of the paddocks that are difficult to see with all the trees in full leaf (and that we have yet to really explore). The field that borders our driveway and VA-20/Stony Point Rd. has some large burn piles and old horse jumps in it. The other borders upon the wooded property to our east and is only accessible by footbridge. It is about halfway progressed back to a forest at this point. 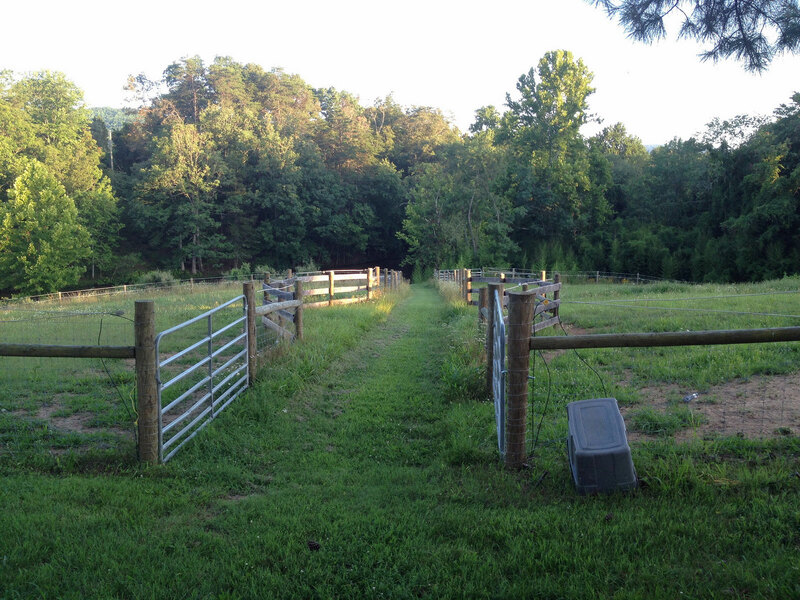 We may try to keep it pasture or use it for orchard or something similar. We'll post more pictures as we work on things!